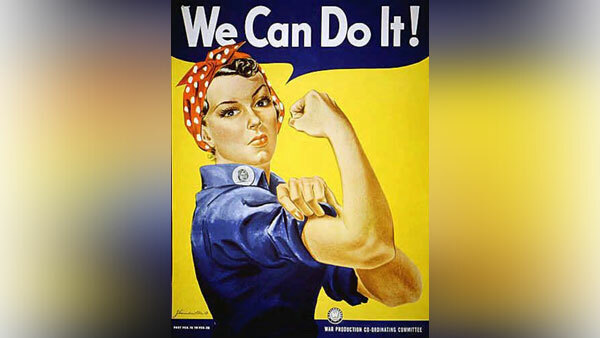 Kickstarter: The Rosie the Riveter of Investing? Two recent studies report women have higher rates of success than men in funding their projects through crowdfunding sites like Kickstarter and Indiegogo. Crowdfunding platforms may be bridging the gender gap for women in the historically male-dominated fields of investing and entrepreneurship, allowing more female entrepreneurs and investors to participate more fully and successfully. “Our findings provide some indication that crowdfunding platforms may lead to increased participation of women on the investing side and increased flows of capital of female-led projects,” wrote the authors of a recent study. This study — from Dan Marom from the Hebrew University of Jerusalem; Alicia Robb from University of California, Berkeley; and Orly Sade from the Hebrew University of Jerusalem — of more than 16,000 successful Kickstarter projects found that the percentage of women who meet their fundraising goal is higher than that of men, with a 69.5% success for women and 61.4% for men. In fact, another recent study found that women have higher rates of success than men in funding their projects on crowdfunding sites like Kickstarter. Another study, by Jason Greenberg from New York University and Ethan Mollick from the University of Pennsylvania, looked at 1,250 random U.S.-based Kickstarter projects with goals more than $5,000 from five categories: gaming, technology, film, fashion and children’s books. Greenberg and Mollick found that women were about 13% more likely to meet their Kickstarter goals than men. They also found that the success rate of women dramatically rose in the male-driven technology category — where less than 10% of the technology projects featured teams led by women. Of those projects, 65% reached their fundraising goals, whereas 30% of the male-led projects succeeded. Previous studies have shown that the investment community often favors male entrepreneurs and businesses started by women receive little venture capital money, with crowdfunding often cited as a way to democratize finance. Danae Ringelmann, co-founder of the crowdfunding platform Indiegogo, launched the platform in 2008 with the goal of democratizing finance. And part of that success may be due to women helping women. Marom, Robb and Sade’s findings show that female-led projects were predominantly financed by women. According to their research, the percentage of female investors was significantly higher for female-led projects (55%) than for male-led projects (46.7%). About 23% of projects that men invested in had female project leads, whereas more than 40% of projects that women invested in had female project leads. Some may say women’s success at crowdfunding is related to the fact that women ask for and receive less money than men. The average goal for female-led projects was about $6,300, compared with an average of more than $9,400 for men, and the mean amount raised by men was close to $5,200, compared with about $4,500 for women, according to Marom, Robb and Sade’s research. The three researchers debunked that assertion by looking specifically at projects in the same category and subcategory, and with the same fundraising goals. “Women were still more likely than men to reach their funding goal (80% versus 73.7%), providing evidence that it was not the lower goals driving the higher rates of success among females,” they state. The numbers of women participating in crowdfunding platforms differ starkly from those outside these platforms. Marom, Robb and Sade’s research showed that women made up about 35% of the project leaders on Kickstarter and almost 45% of the Kickstarter investors. Sally Outlaw, co-founder and CEO of peerbackers.com, pointed to a few reasons why crowdfunding platforms may appeal more to women during the Forbes discussion. As previously reported on ThinkAdvisor, crowdsourced investing got off the ground as part of the 2012 Jumpstart Our Business Startups (JOBS) Act, which gave the SEC the ability to relax rules prohibiting the general solicitation of investments. The JOBS Act of 2012 included two provisions for crowdfunding. Title II, which came into effect in 2013, governs entrepreneurs and lets companies publicly share and advertise that they are looking for investments. Title III would allow companies to raise capital from non-accredited investors and has been mired in an SEC review of more than 500 proposed rules related to Regulation A since last October. Earlier this year, SEC Chairwoman Mary Jo White said this was one of the agency’s priorities. “I expect that the commission, after thorough consideration of all comments, will move expeditiously to finalize these rules,” White noted at the time.